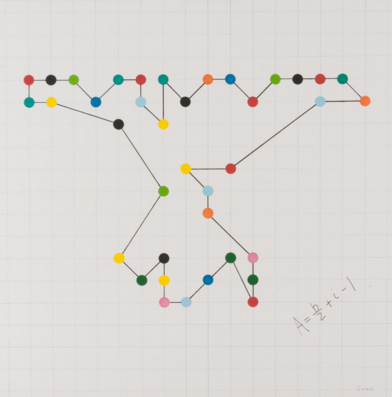 “Mathematics and art provide a minimalist language through which to explore universal truths," he explains. The math whiz–turned-painter stopped by artnet's New York City headquarters to chat with us about Banksy, topological foundations, and his ode to Martin Luther King, Jr. Typically, when people think of mathematics, they think of the left brain—dry, monotonous, boring. When they think of art, they think of the right brain—beauty, awe-inspiring, creativity. But theoretical math is in fact creative and abstract. You're trying to develop consistency and weigh in on truth. But it's more than that, because not all theorems are created alike. It's really a question of beauty: there's symmetry and elegance in these applications. There is beauty in trying to combine two deep theorems. Artists deal with this search for truth and quest for beauty, and at high theoretical levels, mathematicians try to accomplish the same thing. Two aspects of math really allow for artistic creation. First, math is our most clear language: seven is larger than three, that's a very well-defined statement. If I told you I loved something, that's not defined in the slightest because my love for ice cream is on a different gradient than my love for my girlfriend. Secondly, math is rooted in abstraction. A mathematician can derive or construct any set of axioms, as long as the theories upholding those axioms are consistent. But the axioms don't have to come from the real world at all. Bernhard Riemann developed a theory of differential geometry by which you could conjure up 200 dimensional surfaces—that's about as abstract as you can get. So when you merge clarity of language with deep abstraction, you create a great mechanism for creating beautiful art. Mathematicians also think in analogies. One of the great quotes of 20th-century mathematics is “Good mathematicians think in analogies, great mathematicians think in analogies of analogies." I try to keep this in mind while working. I weigh in on different topics and try to bring disparate concepts together in a logical and seamless manner. That's really the goal of my art. Visually simple elements with deeper meaning. The importance of peace, the moral depravity of genocide, the importance of love and what love really looks like. I know love is a vague term, but let's talk about love at its apex. That's a very important concept to dissect, even for a dry mathematician. You mentioned a focus on genocide—you honor Georg Alexander Pick in your piece Genocide is Evil. Pick, whose mathematical expertise helped Einstein formulate general relativity, died in the Holocaust. Can you discuss the piece's personal significance to you? We still live in a world of deep-seated hatred, just take a look at what is happening in Syria—200,000 people have already died. I started Genocide is Evil with braille dots, pointing to our societal blindness. The dots on the canvas spell out "Genocide is Evil"—the braille marks play a central role in my artistic vocabulary. We're a society of the blind. I hope to arouse motivation, so that people realize they need to step forward in these situations. Likewise, I was taken by your work Voice of Reason, an homage to Martin Luther King, Jr. You mentioned that his voice has become an “audible logic." How did you distill his voice? The background of that painting is visually very chaotic. Martin Luther King, Jr. spoke at a time of great change and chaos; the Vietnam War was at its height and racial divides were rampant. The 1960s were a time of divisiveness and uncertainty. In this painting, I incorporated formal logic in the midst of aesthetic chaos. Formal logic is comprised of symbols that make up the language used by logicians. In braille, using logic symbols, I quote Martin Luther King: “Love is the only force capable of transforming an enemy into a friend." In this dynamic period, Martin Luther King was one of the few people who tried to point us through the chaos. He was one of the few who could see the right trajectory. I was in the Rockaways around the one year anniversary of Hurricane Sandy and was shocked that an hour's drive from Manhattan, people were still suffering the consequences of the storm. I wanted to bring attention to this cause in a lasting way and a coworker had informed me that Banksy was in town. I was already a fan of his work and, after some research, realized that he had done a project for Hurricane Katrina. I thought that a donation to the Rockaways or the Red Cross would dissipate pretty quickly unless it was leveraged. So, I wanted to level a platform, through Banksy's publicity power, to turn the press's attention to the fact that the Rockaways were still in trouble. I'm finishing up the last touches on my upcoming show at Hoerle-Guggenheim. I was in the studio yesterday working on an “ode-to" Kandinsky piece. He is a role-model of sorts for me. When I think about what I'm trying to accomplish with painting, he's definitely someone I look up to, in the sense that he took something like music and tried to represent that on a canvas. I'm attempting to do the same thing with mathematics. Yes, and my new pieces convey that well. In my painting Did You Do This, I nod to Greek mathematician Archimedes. The braille dots are colored in order of Pi. Because Pi is irrational, I move linearly through the braille dots but inside the letters I move randomly. It's a combination of the rational and the irrational. Archimedes died tragically in the Siege of Syracuse so it's an ode to both him and Pick. My lasting message is a call for peace, against the backdrop of two great mathematicians having died in wars. Yesterday, I finished a piece called Paradox in the Origins of Abstract Art. The painting incorporates three paradoxes. The first involves Heraclitus's river paradox in which he asks if a river is ever the same [somebody can step twice into the same river]. The second involves the Ship of Theseus paradox: if an object's components are displaced or replaced, is that object the same object as before the displacement or replacement? The final paradox is verbal: if you have a bundle, stack, or heap of straws and then remove the straws one by one, at what point does it stack or heap lose its “stackness" or “heapness?" This one goes hand in hand with an allusion to Kandinsky's motivation for becoming an abstract artist. He was looking at one of Monet's Haystacks paintings and was taken aback that he had not identified the haystack form before looking at the title of the painting (see Researchers Discover New Claude Monet Haystack Painting). I've combined these three paradoxes and written the words “bundle of ship parts" in braille, using Kandinsky's color scheme. I tried to combine them to express the greater paradox in abstract art: at what point do you lose your reference point? If this is the economics side of me talking, then I'd have to say a Jeff Koons balloon dog. [Laughs] No, but in all honesty, probably a Mark Rothko, I love his colors. My take on colors as a child came from a theoretical standpoint. His use of color is aesthetic, beautiful, and meditative. Saiers' upcoming show, “Second Part of 1," opens at Hoerle-Guggenheim Gallery on April 1 and runs through April 20.